Procurement, supply chain, and finance professionals each have their own individual perspective on when, where, and how supply chain finance can be used. Here we take a broader perspective, 'holistic supply chain finance,' and discuss the potential it holds to unlock strategic value. In most companies, supply chain finance is seen as a narrow and limited tool rather than a critical enabler of enterprise success. As a result, a lot of unrealized value is left on the table. In fact supply chain finance, done right, can generate strategic value throughout the P2P lifecycle, particularly in assuring continuity of supply, reducing COGS, meeting profitability targets, creating more sustainable supply chains, and reducing time-to-market and lead times. Here we explore how taking a holistic approach to supply chain finance, underpinned by a foundational network platform, enables companies to obtain this essential value. In Part 1, we will explain the concept of holistic supply chain finance and network platforms. 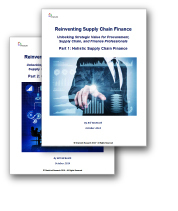 Part 2 provides a description of the core foundational capabilities required of an organization to implement holistic supply chain finance, as well as the benefits that are being achieved by companies taking a more holistic approach to supply chain finance. The Supply Chain Finance Opportunity-- How Much Are You Leaving on the Table? To realize a holistic approach to supply chain finance requires certain capabilities to be available to buyers, sellers, and other participating parties.